The base of the tartan design reflects the historical association with the Clan Macdonald, as well as Scarfskerry in Caithness where my branch of the family descended from. The regional tartan related to Caithness is the Sinclair tartan; therefore inspiration for the new design has been taken from both the setts of the Macdonald and Sinclair tartans. 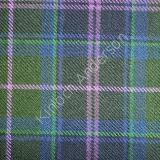 The motives behind the Tartans choice of colours are as follows: Green; signifies the toil and labour of previous generations of Begg family crofters, working the bleak wilds of Caithness. Blue; like many crofting families, working the land was simply not enough to survive on and many of my ancestors went to sea, two in particular were on my mind when having the tartan created. Purple; ostensibly the purple stands for the gentle heather-swept hills of Caithness where, for many years, even after the family had moved down to Edinburgh, was always thought of as home. However, on a more personal note, My Great-Grandmother from whom my strand of the Begg blood comes was said to have beautiful, vibrant violet-coloured eyes.